Sift flour, baking powder, xanthan gum, and salt into a bowl. Cream butter and sugar until light and fluffy. Add eggs one at a time beating well in between. Add lemon juice and zest, followed by flour. Beat to combine. 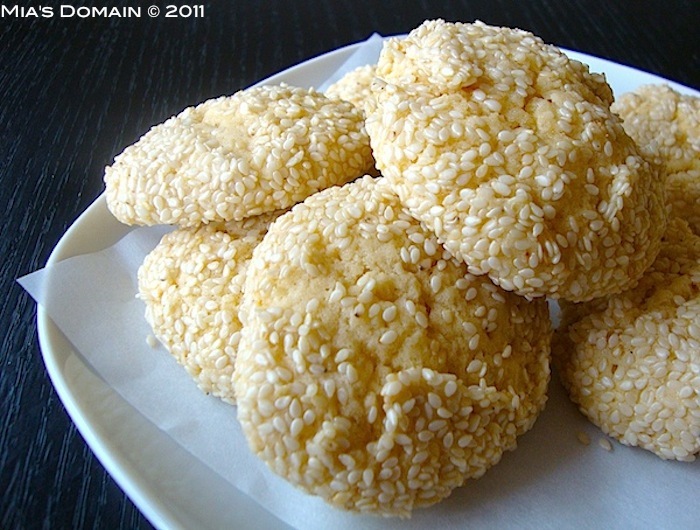 Drop teaspoonfuls of the cookie batter into the sesame seeds and roll with a teaspoon to fully coat. Arrange in a lined cookie sheet about 2 inches apart. Bake for 20 minutes or until cookies are slightly browned and crispy. Remove from the oven. After about 10 minutes, move cookies to a cookie rack to cool completely.